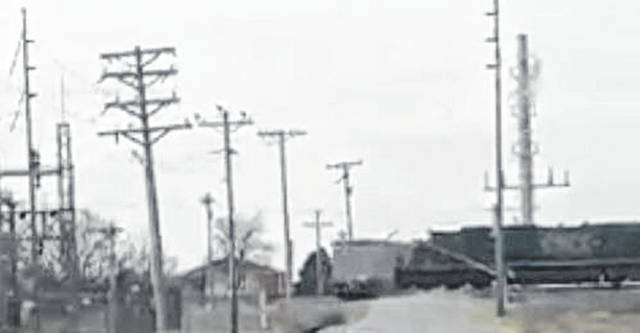 This still from a video shows a train crashing through a truck stop atop the tracks Thursday afternoon. COLUMBUS GROVE — A semi truck carrying cattle became stuck on the railroad tracks on Putnam County Road O and was hit by a train Thursday afternoon. All 29 cows aboard the truck were either killed during the collision or had to be put down, said Sgt. Bryan Hoover of the Putnam County Sheriff’s Office. The driver of the semi, Kyle Shroyer, 33, of Danville, Indiana, was able to get out of the truck before it was hit. The incident occurred at 2:15 p.m. State Route 65 was closed for more than five hours before reopening at 8 p.m. The crossing on Road O remained closed. According to a report from the Putnam County Sheriff’s Office, the CSX train was heading southbound when it collided with the cattle truck, which was traveling westbound. Deputies did not say what caused the cattle truck to become stuck, nor did they say how fast the train was traveling. Assisting at the scene were Columbus Grove EMS and fire department, Ottawa Heavy Rescue, Putnam County EMS, Ohio Department of Transportation, Columbus Grove and Ottawa police departments.